When you think about all the songs and artists that have topped the charts over the years – lest we forget, a song by Mr. Blobby was once the Christmas number one – suddenly a sea shanty album by a male a cappella group from Cornwall cracking the top 10 suddenly doesn’t seem so far-fetched. That feat was achieved by Fisherman’s Friends, a real-life group of fishermen from Port Isaac in Cornwall who in their spare time enjoy singing sets of traditional sea shanties, and who in 2010 signed a record deal with Universal Music which launched their careers, especially when they peaked at #9 on the albums chart in May of that year. 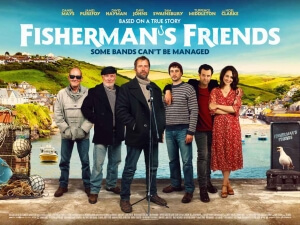 Naturally, a movie about these humble singers just had to be made, so lo and behold we have Fisherman’s Friends, which when you break it down is harmless enough, but is working with such a formulaic and cliché-ridden story that it sadly never becomes quite as interesting as the very group whose story it is depicting. The film sets itself in 2010, and follows cynical record producer Danny (Daniel Mays) as he accompanies his fellow record executives – including Noel Clarke who, for whatever reason, has adopted a really bad American accent which sounds so out of place in a cast that’s otherwise comprised entirely of Brits – on a stag do to Cornwall. There, they stumble upon the group of the title – with the most prominent characters played by the likes of James Purefoy, David Heyman and I, Daniel Blake’s Dave Johns – and as part of a wind-up the execs convince Danny to try and sign them for a record deal; however, Danny very quickly discovers the genuine nature of their act, and dedicates himself to making sure their music is heard by the masses. In the meantime, Danny develops a relationship with Purefoy’s character’s hotelier daughter Alwyn (Tuppence Middleton), and through that as well as his connection with the band he learns the value of life and family et cetera. You more than likely know where things go from there, not just because you’re probably already aware of the band’s unlikely success, but because it’s following the exact same formula that’s been done so many times before in other movies, with very little added that’s fresh and interesting. The movie has a message about not being so cynical about things, yet it’s coming from a script so formulaic and cliché-ridden that there is ironically a sense of cynicism within its own preaching against that very thing; the moment that certain characters meet, certain plot points become known, and certain words of dialogue are spoken, there’s no point in really caring about what happens next because you’ve predicted it long before it happens on screen, and you’re left there to patiently wait for said thing to happen whilst at the same time not really caring much about the story or characters unfolding in front of you. It definitely feels like a product designed to capitalise on the underdog narrative aspect of this real-life band, and while I’m sure they enjoyed making it – I mean, who wouldn’t enjoy being involved in a movie based on your own exploits? – the script barely does anything to stray away from formula, and does their feel-good story a bit of a disservice by having it be such a cookie-cutter format that’s unoriginal as the numerous public domain songs they enjoy singing. The story they’ve come up with, aside from it following the exact same formula as countless other movies like this, is mostly stale and bland, with the majority of the band members largely being side-lined – some of them don’t even have lines – in favour of a vanilla love story between Daniel Mays and Tuppence Middleton’s characters, complete with a cutesy kid who exclusively has dialogue that’s come straight from an episode of Fuller House. Even when it does focus on the band’s unlikely rise to the charts, it’s the same standard music biopic fare that plagued even Bohemian Rhapsody, and it’s portrayed in such a disingenuous and fabricated manner that it makes becoming a chart-topping artist look ridiculously easy, which as we all know is far from the truth. From its stale, uninteresting and endlessly clichéd story, to cartoonishly exaggerated characters – including, once again, Noel Clarke with a distractingly bad American accent; seriously, there is no reason for him to be American in this film, so why even attempt it? – it never makes a compelling enough argument for us to care about these people and why their music matters, which again undermines the real band’s natural charm and genuinely unique sound that originally made them stand out. But as deeply unoriginal as the movie is, it’s never a hateful one; it has a heart that’s clearly in the right place, and went in with the noblest of intentions (even if those intentions included making a quick buck off of the band’s initial success), but even though it didn’t quite work out as well as they had hoped, they should count themselves lucky that the movie is mainly just boring and not rage-inducing. You could argue that it’s worse to not feel anything than feel some kind of emotion, but I’ve honestly seen movies that are much harder to sit through than this, so I’ll happily let this one just fade into obscurity without it leaving too much of an impact on me. For others, it’s probably best viewed as either a matinee screening, or wait until it comes to terrestrial daytime TV, when it can be played for its prime audience without them having to spend too much money on it. Or, I don’t know, maybe find and listen to the real band’s music; it’s a lot more soulful than this film. Fisherman’s Friends suffers deeply from an endlessly-clichéd and formulaic script that does very little to stand out from other music biopics, which does the band it’s depicting something of a disservice by being more standard and non-unique than they themselves are.